Onward in Oncology: Bruno Strigini, the outgoing head of Novartis Oncology, talks tradition, new launches, pricing and value—and what he believes is the start of a golden age of innovation in cancer science. Pharm Exec partner PharmaBoardroom, whose “Country Report” series is regularly featured in these pages, spoke recently with Bruno Strigini, CEO of Novartis Oncology. They discussed the drug giant’s latest efforts and successes in fighting a disease that remains on the rise globally, and touched on the broader trends and Bruno Strigini, CEO, Novartis Oncologyinnovation that are propelling new hopes in cancer care. Please note that this interview was conducted in October 2017. Strigini has subsequently announced that he will retire from Novartis Oncology in early 2018. During his time at the company, Strigini led the integration of GlaxoSmithKline’s oncology programs acquired in 2015, navigated Novartis through its Gleevec patent expiration a year later, and, in 2017, helped the organization gain the first regulatory approval of a chimeric antigen receptor T-cell (CAR-T) therapy. PB: Novartis is notable for being the first of the big pharma firms to assemble a global business unit dedicated solely to developing and launching innovative oncology medicines. Why was it deemed necessary to adopt this sort of corporate structure of a “firm within a firm?” What advantages does it bring? 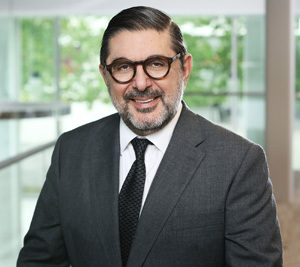 Strigini: Novartis’ first great foray into oncology dates back to 2001 with the launch of Gleevec, which was a truly revolutionary cancer drug and formed part of a pioneering group of targeted treatments designed to attack a specific cancer-causing genetic mutation. With the advent of Gleevec, the outlook for CML (chronic myeloid leukemia) patients changed dramatically, and it is great to hear from patients who have the prospect of a normal life 15 years after starting the treatment. Another critical juncture came in 2015 when we acquired GSK’s oncology business, comprising important products such as Revolade, Votrient, Tafinlar, and Mekinist, as part of a broader portfolio swap between the two companies. Our organizational structure, which right from the beginning was set up as a dedicated business unit focused on treatments for cancer, was key to our success. This organizational set-up underscores Novartis’ unwavering commitment to pioneering new generations of oncology therapies, and it also provides a real sense of purpose and focus. The overarching idea was to create a nimble outfit, with speedy decision-making power to accelerate the development and commercialization of our products. One of the aspects that has impressed me the most since I joined Novartis has been the sense of purpose of our associates, and I believe that arises partly from having an organization fully focused on oncology. This is a modus operandi that works, and that’s why we’re now seeing our competitors trying to emulate us in this respect. Looking at our productivity in 2017 alone, which includes three new therapy approvals, it is clear that the model we established makes good sense. We launched Rydapt in the US and Europe for two rare, life-threatening indications, including a mutated form of acute myeloid leukemia. Also, [last year] we achieved both US and European approval of Kisqali for treatment of postmenopausal women with locally advanced or metastatic breast cancer. Finally, in late summer we were the first company to receive approval for our breakthrough CAR-T cell therapy, Kymriah. PB: How, then, is the unit structured? What are the key functions and areas of priority? Strigini: Novartis Oncology is a global leader in the oncology, hematology, and rare cancer segment, with an unmatched portfolio of products, including more than 20 approved medicines. We also have one of the broadest pipelines in the industry, with over 40 or so new molecular entities in development, including targeted and immuno-oncology compounds. Our research is driven by a distinctive scientific and clinical strategy, focusing on unmet medical needs. Having initially established ourselves as one of the foremost companies in the development of small molecules against cancer, we have now additionally assembled one of the largest pipelines in immunotherapy, with 18 different compounds. In addition, we are pioneers in CAR-T cell therapies, a new class of immunocellular therapies. Strategically, we have prioritized five therapeutic areas: breast, blood, and lung cancer as well as melanoma and renal cell carcinoma. This does not mean we are not doing anything in other areas, for example, our R&D groups are active in colon and bladder cancer, but it does help us retain focus in areas where we have depth and breadth of experience. In a highly competitive environment where 40% of the industry’s investment is in oncology drug development, we must keep to our core strengths. In terms of our scope and reach, there are more than 10,000 associates fully dedicated to oncology spread across 85 countries, including eight R&D centers. With this level of experience, knowledge, and investment behind us, we find ourselves equipped and ready to transform cancer care by bringing more breakthrough products to patients and society. PB: Tell us about the significance of the CAR-T milestone with Kymriah and how it relates to the positioning of Novartis’ oncology business today? Strigini: We were very proud indeed to see Kymriah, the first immunocellular therapy approved in the US for the treatment of children and young adults up to 25 years of age with B-cell precursor acute lymphoblastic leukemia that is refractory or in second or later relapse. This is a truly game-changing and revolutionary product that responds to an unmet need that is clearly established. Trial results have demonstrated a high level overall remission rate in this patient population with limited treatment options and historically poor outcomes. The CAR-T journey started five years ago when we began collaborating with the University of Pennsylvania and invested in bringing—what we believed would be—a paradigm-changing therapy to cancer patients in dire need. Basically, it is a highly personalized therapy in which T cells are drawn from a patient’s blood and reprogrammed in our cell processing facility. These genetically coded T cells are infused back into the patient to potentially “hunt” the patient’s cancer cells. This represents an entirely new approach for treatment. Our hope is now to be able to progress this “new wave” of CAR-T therapies in a host of hematologic and potentially other cancer types. Overall, our R&D portfolio is made up of two core segments: “targeted therapy,” including our small molecule technology and monoclonal antibodies; and “immunotherapy,” comprising our immuno-oncology pipeline. As CAR-T is an immunocellular therapy, it fits perfectly into our overall strategy to attack cancer in a modality-agnostic way. PB: Kisqali was approved in Europe one week prior to Kymriah. What were the comparative experiences of the market access teams for the EU and US with regards to these two scientific advances in oncology? Strigini: The strategies for getting these two different therapies to market had to be thoroughly different. Kymriah needs to be administered in specialized treatment centers and is an individualized approach to modifying a patient’s own cells to fight cancer that brings all sorts of additional complexities in terms of manufacturing, handling, and logistics. To address the unique aspects of the therapy, we had to go and develop custom-made patient access programs to support safe and timely delivery. Kisqali, on the other hand, is about a classic small molecule, and our focus was and is to differentiate our offering from competition. The dynamics of the two markets are also very different. In the US, the market is a mix of private insurance providers, Medicare, and Medicaid. In Europe, you are largely talking about healthcare systems with universal coverage and country-by-country access and pricing negotiations. Our approach in all instances, however, is consistent—and that is to emphasize the principles of value and outcome of our medicines. PB: Kymriah comes in at a hefty price tag at $475,000, putting it as one of the most expensive drugs of all time. How did Novartis come to this figure and go about its pricing strategy, especially considering the current cost-cutting climate and potential political and reputational ramifications? Strigini: We put a great deal of thought into how to price Kymriah. We conducted our own detailed health economics analysis, looked into standard-of-care pricing such as bone marrow transplant, and took into account independent evaluations such as those of NICE (National Institute for Health and Care Excellence), which estimated a cost-effective price of between $600,000 and $700,000. Let’s not forget either, that Kymriah is delivered to each patient just once because this is intended to be a one-time, highly effective treatment. When considering this altogether, the value of what we are proposing becomes more readily apparent. Importantly, we have also announced a collaboration with the US Centers for Medicare and Medicaid Services (CMS), which represents a first-of-a-kind arrangement in the US. This includes an outcome-based approach and indication-based pricing. PB: How do you reply to those who argue that the extent of current public expenditure on oncology drugs is disproportionately high and does not necessarily represent optimum value for money spent vis-à-vis competing claims (such as for antibiotics)? Strigini: Cancer is clearly on the rise. Right now, cancer causes one in eight deaths globally and, in Europe, it is even outpacing cardiovascular disease in terms of prevalence. The World Health Organization (WHO) is now estimating that global cancer rates will be close to 22 million new cases per annum by 2030. A recent study involving the EU’s five biggest markets demonstrated that cancer affects mostly people in their prime in terms of ability to be productive. The societal cost to those five countries was estimated at €50 billion just in terms of lost productivity. At the same time, science and medicine are progressing very rapidly, and cancer treatments are becoming more effective. This allows for the right drug to be employed at the right time for the right patient. Clearly, industry and the rest of the life sciences community have to work alongside healthcare providers, payers, and policymakers in rendering cutting-edge oncology drugs accessible and affordable to all patients. We believe an outcomes and value-based approach will help in achieving this objective. PB: What steps, then, are you taking to make pioneering oncology drugs more accessible to patients in lower-income countries? Strigini: We have different programs to facilitate access to our cancer drugs. One that I would like to highlight is our collaboration with the Max Foundation, a global, patient-focused, non-governmental organization. In September, Novartis announced a new collaboration with the Max Foundation to support continued access to treatment at no cost for nearly 34,000 current patients with CML, gastrointestinal tumors, and other rare cancers. We have been longtime collaborators in providing access to care for patients in lower-income countries through the Gleevec International Patient Assistance Program (GIPAP), one of the most innovative patient assistance programs ever implemented on a global scale. The new collaboration, called CML Path to Care, is an evolution from GIPAP. Under the new initiative, the Max Foundation will assume from Novartis the responsibility for delivering our CML treatments to these patients, including supply chain management, and Novartis will provide the funding and drug donation support. PB: Novartis has formulated its very own definition of value. Tell us more about this. Strigini: For us, the value of our products includes four components. First, there is clinical value. Second, there is value to the patient in terms of quality of life. Third, impact on the total healthcare budget; for example, if a new drug avoids expensive hospitalization, then the cost saving being generated needs to be taken into account. Finally, there is the societal value of getting the patient back to being a productive member of the economy. In short, we look at value holistically. The comparative value of a drug should be calculated against how well it performs with respect to each of these four criteria. PB: Do you see the concept of value-based pricing gaining traction with governments? Strigini: Yes. The arrangement that we struck with CMS in the US demonstrates that healthcare systems are seeing the potential benefits and are prepared to engage. In Europe, we also witness progress being made on health technology assessment and willingness to start the dialogue on outcome-based approaches. PB: Where do you see the emerging trends right now? Strigini: There is a huge amount of innovation in the science of cancer. Digital disruption is also shifting the paradigm; this is clearly the case at Novartis. Big data, predictive modeling, and advanced analytics are changing the way we work in all aspects of our business: research, development, and commercialization. For example, in research, it is helping us to shorten the time between finding a target and proof of concept. Also, the use of real-world evidence could transform the way we approach the development and regulatory processes for a drug. In short, a golden age of innovation is upon us and convergence is occurring across different areas of science, technology, biology, and IT. The onus is on the pharma industry to embrace this change and leverage it. These are all highly positive steps that bring stakeholders together to the benefit of the patient. PB: Do you have a few words to conclude on Switzerland—Novartis’ global base—and its role in the life sciences? Strigini: Switzerland is the home of two of the top global pharmaceuticals players. It possesses a vibrant and flourishing life sciences industry and is also notable for having one of the best functioning healthcare systems. Part of this no doubt derives from a historical tradition of innovation and engineering, and I believe the country’s openness and collaborative spirit contributes greatly to this success.